More major players in international finance and industry are pulling out of a high-profile business conference in Saudi Arabia in the wake of reports that a Saudi writer critical of the government disappeared and is feared dead after entering a Saudi consulate in Turkey. The chief executive of JPMorgan Chase & Co., Jamie Dimon, had been a featured speaker at the conference in Riyadh. The Wall Street Journal reports that Dimon has backed out. Ford Motor Co. confirms that Executive Chairman Bill Ford will not attend. He too had been scheduled to speak. Turkish officials have said they fear a Saudi hit team killed Washington Post contributor Jamal Khashoggi. The kingdom has called such allegations "baseless" but has not offered any evidence Khashoggi ever left the consulate. A member of the U.S. Senate Foreign Relations Committee says the U.S.-Saudi relations may need "to be completely revised" if an investigation finds the kingdom's government responsible for the murder of Washington Post contributor Jamal Khashoggi. Rubio tells CBS' "Face the Nation" that "we can never be a voice for human rights anywhere in the world if we allow a situation like this to go forward and us do nothing about it." The senator calls Saudi Arabia "a key leverage and hedge point against Iranian influence in the region." But, he adds, that "cannot supersede our commitment to human rights." A leading U.S. senator says Treasury Secretary Steven Mnuchin shouldn't attend a major investment conference in Saudi Arabia later this month in the wake of reports that journalist and U.S. resident Jamal Khashoggi may have been killed at the Saudi consulate in Istanbul. Florida Republican Marco Rubio tells CNN's "State of the Union" that he doesn't think any U.S. government officials "should be going and pretending as it's business as usual, until we know exactly what's happened here." But White House economic adviser Larry Kudlow says the conference will deal with terrorist financing and how to stop it, and that "at the moment," Mnuchin intends to go. Kudlow tells ABC's "This Week" that Mnuchin "will make up his mind as the week progresses and as new information surfaces" and the investigation proceeds. A White House aide says President Donald Trump is serious when he says there'll be "severe punishment" if Saudi Arabia is found to be complicit in the disappearance of U.S. resident and journalist Jamal Khashoggi. Economic adviser Larry Kudlow says that when Trump "warns, people should take him at his word." Kudlow isn't saying what Trump could do, but says Trump will "decide what the proper actions" are. Saudi Arabia is the world's top oil exporter, and Kudlow was asked on "Fox News Sunday" whether a Saudi response could affect energy prices. Kudlow calls the U.S. "the dominant energy player so we're in pretty good shape in my opinion with our energy boom to cover any shortfalls." Khashoggi hasn't been seen since he entered the Saudi consulate in Istanbul on Oct. 2. Germany, France and Britain are calling for a "credible investigation" to establish what happened to Saudi writer Jamal Khashoggi and seek a "complete and detailed" Saudi response. Khashoggi went missing when he visited the Saudi Consulate in Istanbul. Turkish officials fear Khashoggi was killed and dismembered, allegations Saudi officials call "baseless." The German, French and British foreign ministers said in a joint statement Sunday that defending freedom of expression and ensuring protection for journalists are key priorities and that they are "treating this incident with the utmost seriousness." They said there must be a credible investigation to establish the truth and "if relevant" identify those responsible for Khashoggi's disappearance. "We encourage joint Saudi-Turkish efforts in that regard, and expect the Saudi government to provide a complete and detailed response," they added. Saudi Arabia says it rejects any "threats" of economic sanctions or political pressure after President Donald Trump's comments on the disappearance of Jamal Khashoggi. The statement carried by the state-run Saudi Press Agency on Sunday also warned that the kingdom will respond to any steps taken against it. This statement came after the Saudi stock market plunged by nearly 7 percent at one point on Sunday. The statement did not directly acknowledge Khashoggi's disappearance, which happened Oct. 2 when he visited the Saudi Consulate in Istanbul. Turkish officials fear Khashoggi was killed and dismembered. Saudi officials call the allegations "baseless," but have offered no evidence Khashoggi ever left the consulate. The Saudi stock market has dropped more than 6.8 percent after President Donald Trump threatened "severe punishment" over the disappearance of Washington Post columnist Jamal Khashoggi. 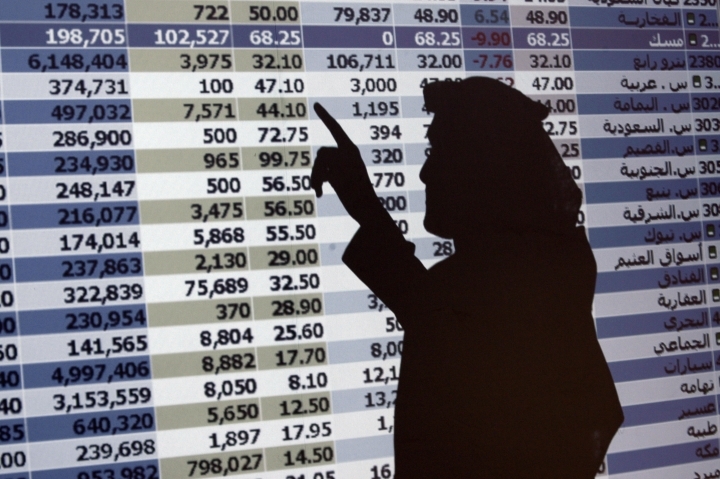 The drop in the Tadawul exchange in Riyadh happened Sunday, the first day of trading. In an interview to be aired Sunday, Trump told CBS' "60 Minutes" that "We're going to get to the bottom of it and there will be severe punishment." Turkish officials say they fear Saudi agents killed Khashoggi after he entered the Saudi Consulate in Istanbul on Oct. 2. The kingdom has called the allegations "baseless," but has offered no evidence the writer ever left the consulate.